When my space is cluttered I find it difficult to work efficiently and the mess becomes an emotional and energetic drag on my day. Recently I replaced my kitchen table with one that fits the space much better than its predecessor and took the opportunity to organize the piles of clutter that had made it their home. My tiny NYC apartment feels much more open and comfortable because that space is cleared. Sometimes dealing with clutter is about more than setting aside the time to clean up. If you are having a hard time decluttering your space, it’s likely that there is an emotional component at play preventing you from taking action. 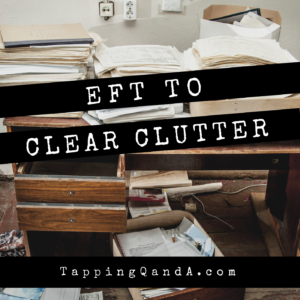 In this week’s podcast I have for you my favorite technique for clearing out clutter and a tap-along to help you get started. I recognize the fact that there is a huge amount of clutter that I need to deal with…It feels so overwhelming…It feels like it’s never going to get done…Who knows what I’m going to find in those piles…I might be worried about what I’m going to discover…I also recognize the fact it feels like it is too much work…It is never actually going to get done…I am going to find myself stuck in the middle of this mess forever…I recognize the fact that if I take this a little at a time…If I clean this up bit by bit…Those small steps will make a huge difference…Every little bit of cleaning I do will move me closer to having this completed…Every bit of cleaning I do creates more space…It creates more movement…It makes my space more comfortable…Even if I only do some of this…It will make a difference in the long run…I give myself permission to allow that to happen…To see this as a gentle process…As I remove each little bit knowing I will feel better…I don’t have to do this all at once…If I do this a little at a time I will be done sooner than I could imagine. This was really great, you brought up some ideas that I never thought of (reason behind the clutter). It really opened my eyes.